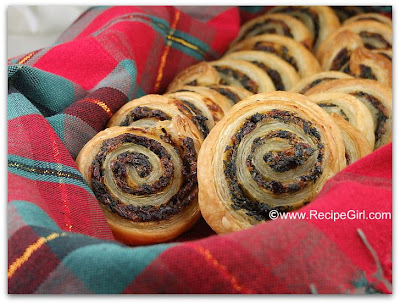 I'm still baking away in the final moments before Christmas, but I've decided to turn my attention toward blogging about a nice appetizer that would be terrific for Christmas or New Year's celebrations. 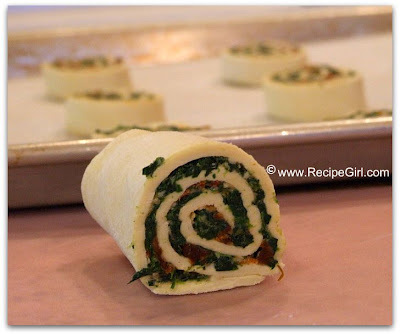 Here's a colorful little bite: Spinach & Sun-Dried Tomato Puff Pastry Pinwheels. 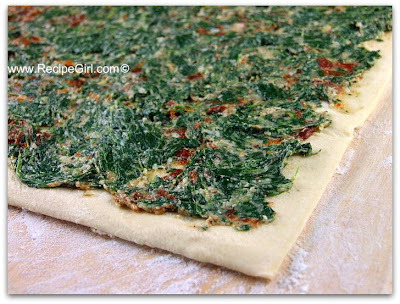 A mix of frozen spinach (thawed), sundried tomatoes, mayo, Parmesan and a few spices is spread onto thawed-out prepared puff pastry dough sheets. The sheet is rolled up tightly, wrapped and placed into the freezer. At this point, you can choose to store the roll in the freezer and cut as needed for spur-of-the-moment appetizers. 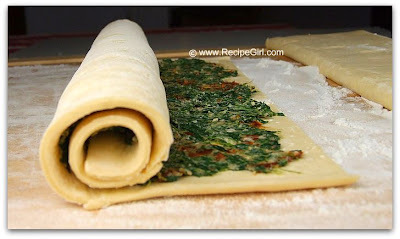 Or you can freeze for 30 minutes to let it firm up slightly and then slice & bake immediately. 1-inch slices baked for about 20 minutes and they're ready to eat! Lightly goldened and crisp, these are deliciously simple appetizers. You can choose to make them ahead of time and just pack them in a basket until ready to use (same day), or you can serve them fresh out of the oven. Impressive looking little treats for something so inherently easy to make, aren't they? Plenty more appetizer recipe favorites can be found HERE and HERE.